Still image from Ben Schmidt’s “American Whaling Mapped,” used by permission of the creator. For many years, I taught an introductory history class that immersed students in the primary documents of a whaling voyage that in 1857 was interrupted by a bloody mutiny, the mutiny on the New Bedford, Massachusetts whaleship Junior.1 The one class activity that always energized students and produced epiphanies was to have them trace the course of the ship up to the spot off Australia where the mutiny took place. I presented them with a blank base map of the world that identified whaling grounds (the ocean locales frequented by sperm whales, right whales, bowheads, humpbacks, and/or Pacific gray whales) and an abstracted logbook of the Junior voyage that gave latitude and longitude and ports of call.2 They had to create an attractive, accessible, informative route map by the end of the class period. I have done similar workshops with younger students. It is easy, fun, and generative of a new understanding of the nineteenth-century maritime world, the global environment, and mapping as a means to visualize space and movement. Such an exercise could be worked into a class on almost any topic. In a course on maritime history, it is of course absolutely necessary for students to see what the maritime world looked like to laborers and passengers and how maritime traffic followed certain routes for certain reasons. For the first half of the U.S. history survey or for a course on the early republic or nineteenth century, the American economy’s heavy investment in overseas activities can be partially revealed by such maps that show the global scope of American shipping, especially since their textbooks likely represent Americans in that time period as focused solely on westward expansion. Voyage maps could also be deployed in courses on environmental history or the history of science and technology. The paths taken by whalers depended more on natural elements than on their own desires. Ships were machines that relied on wind power, and whaleships hitched rides on currents to head to the richest feeding or breeding grounds where whales congregated or to the volcanically generated archipelagos that provided respite on long voyages. In short, the voyage map as an individual, small-group, or class exercise can be put to 101 pedagogical uses. The first problem students tackle is figuring out how to think in terms of latitude and longitude. The rectangular base map they are confronted with has marks along the edges indicating degrees of latitude and longitude, but there is more to it than just finding the meeting point of X and Y, since the schema of latitude and longitude rests on a division of the world into quadrants referred to by some combination of E, W, S, and N. A related problem the students have to solve is locating the ports of call. Whaleships most often stopped for fresh water, provisions, and additional laborers at obscure islands that today’s students have never heard of. 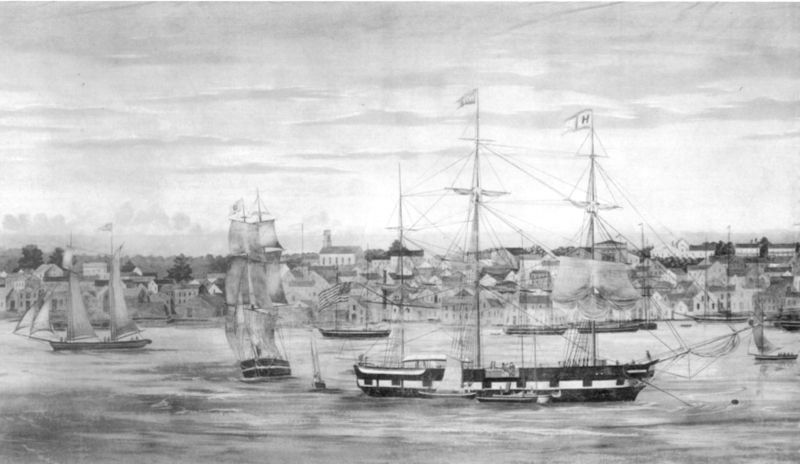 A typical nineteenth-century whaling voyage out of New Bedford would ride the Gulf Stream to the Azores (“Western Islands”), then head south to the Cape Verde Islands or Rio de Janeiro, rounding Cape Horn to rest up at one of the small seaports on the South American coast before sailing to the Galapagos Islands, Marquesas, Hawaiian Islands, Tahiti, the New Zealand or Japan Grounds, or up to the Arctic, returning by way of the Cape of Good Hope, with the south Atlantic rocky outpost of St. Helena as the last stop before reaching home. On its outward passage, the Junior visited another South Atlantic island, Tristan da Cunha. In my students’ deliberations, finding Tristan Da Cunha and reflecting on why a ship would go there was always a challenge culminating in a mental breakthrough and a sense of achievement. I let them use their phones for this exercise, since Google and Google maps are essential tools that help students to place the logbook’s locations on the base map accurately. Google searches, usually, also can overcome poor spelling and antiquated terminology. Detail of “Whaling Voyage Round the World,” ca. 1848, a panorama by Benjamin Russell (1804‒1885) and Caleb P. Purrington (1812‒1876). Courtesy Wikimedia Commons. nineteenth-century whaleship, the world looks different than it does today. Islands were vital nodes for ship traffic and played a crucial role in bringing the world into global connectedness. In our time, air travel has created an alternative global network that elevates urban centers, instead of island way stations, into the hubs through which people and goods flow from one part of the world to another. The conjunctions and disjunctions between the age of sail and the present day are further illuminated by whaling grounds as destinations. By recording dates on the map, students will realize how much time it took to travel across the ocean and how much time a whaleship lingered in any one place. If every day is recorded as a dot, students will notice density at certain whaling grounds as ships spent months at a time cruising back and forth on the deep ocean, their crews scanning the horizon for flukes, breaches, or spray from a whale’s spout. If each whale caught is recorded, students can calculate the economic gains and environmental costs of a voyage dedicated to extracting oil and baleen from the sea. If you try this exercise, once students have their map completed, show them the beautiful and incisive moving map of the American whaling industry that Ben Schmidt created from U.S. Navy researcher Matthew Fontaine Maury’s mid-nineteenth-century collection of logbook data.3 From Schmidt’s map, students can watch the progression of the industry as it migrated from overhunted whaling grounds to fresh territory, and they can place the voyage they have tracked in chronological context. In a larger sense, constructing a map from text is one form of analytical thinking; so not only do students learn about nineteenth-century maritime history by turning a logbook’s mundane, daily entries into a synthetic graphic depicting the entire voyage, they also must interact with a historical document by closely scrutinizing every piece of information it offers. Furthermore, the translation of words into a line showing movement and the passage of time leads to a tangible final product, an overview of a historical process (a voyage) the contours of which cannot otherwise be so readily grasped. In sum, assigning students this task teaches them about nineteenth-century maritime history while demonstrating the value that can result from close analysis of a historic source. 1 Nancy Shoemaker, “Where Is the History Lab Course?” Perspectives on History 47 (Jan. 2009), 24‒26. 2 My base map comes from the endpapers of Briton Cooper Busch, “Whaling Will Never Do for Me”: The American Whaleman in the Nineteenth Century (Lexington, KY, 1994). For the earliest and most famous map of nineteenth-century whaling grounds, see Matthew Fontaine Maury, “Whale Chart,” Norman B. Leventhal Map Center Digital Collections, Boston Public Library, collections.leventhalmap.org, accessed Feb. 5, 2019. I transcribed and abridged the logbook of the Junior, 1857‒1858, from the original in the New Bedford Free Public Library, New Bedford, MA. 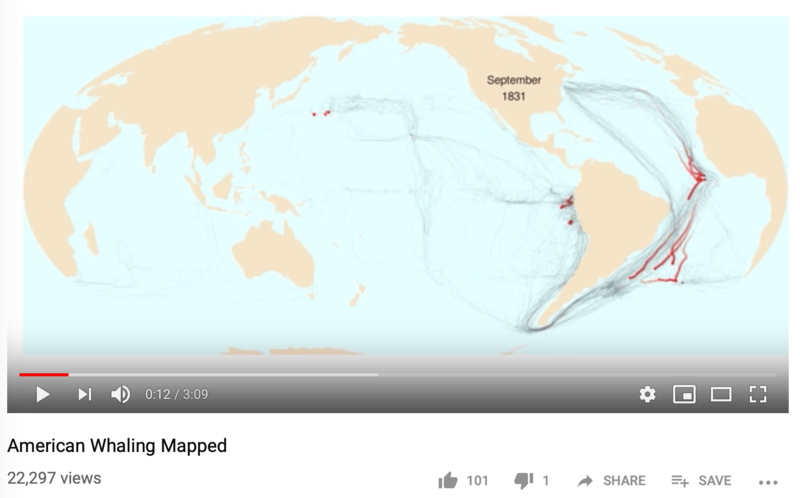 3 Ben Schmidt, “American Whaling Mapped,” Youtube, https://www.youtube.com/watch?v=Tn7fQ5mYHPA, and his blog, http://sappingattention.blogspot.com/2012/11/reading-digital-sources-case-study-in.html. Various consortiums of scientists, historians, and museum professionals have mined data from whaling logbooks for such projects as the History of Marine Mammal Populations (HMAP)—see https://collections.plos.org/hmap—and a climatology initiative, which is fueling additional whaling logbook transcriptions: Old Weather, Zooniverse.org. The largest collections of whaling logbooks increasingly are being made available online; see the growing collection of digitized whaling logbooks and journals of the New Bedford Whaling Museum at https://www.whalingmuseum.org/explore/library/logbooks-journals; the Nicholson Whaling Collection, Providence Public Library, https://www.provlib.org/research-collections/historical-collections/nicholson-whaling-collection/; Mystic Seaport Museum, https://research.mysticseaport.org/indiv/?post_type=mystic_items, which is also is a gateway into the American Offshore Whaling Voyages database. All cited websites were accessed Feb. 3, 2019. Nancy Shoemaker is Professor of History at the University of Connecticut.